Posted on January 25, 2019 , in Hot Tubs. Do you have sensitive skin? You may have wondered how hot tub jets will affect your skin and if they can cause bruising or pain. Rest assured that it is unlikely a hot tub jet will ever cause bruising, but it is possible the jets can create some discomfort. This can be for a number of reasons, ranging in cheap hot tubs to simply a person’s water pressure preference. In the following article, we discuss what you should know to ensure you have a comfortable hot tub experience and how a hot tub can potentially help with healing bruising. Are Hot Tubs Good for Bruises? Some people are more prone to bruising. If this is you, it may be tempting to enjoy a soak to help relieve some of your symptoms. However, taking a soak following an injury can actually cause more bruising. The heat can increase swelling, thus worsening the appearance of the bruise. Following most injuries, it is important to apply ice to reduce symptoms. While this all may be true, hot tubs can potentially help a bruise go away quicker. Wait a day or two after the bruise appears, then take a soak. Your body temperature will rise in the spa water, causing the blood vessels to dilate and increase blood circulation. This increase in blood flow can help accelerate the natural healing process. Another way of putting this is, hot tubs can help bruises heal faster than normal. Can Hot Tub Jets Hurt? Unfortunately, hot tub jets may occasionally feel uncomfortable. If this does occur, this is likely due to one of two reasons, either the jets are too strong or not adjustable. These two problems are common in cheap hot tub models. A common selling point with these models is that they have the strongest or highest number of jets on the market. In reality, neither of these factors matter. What is important to keep in mind is that a therapeutic and effective therapeutic massage is coming from the pressure flexibility of the water combined with its customized features. The jet location has a lot to do with effectiveness. 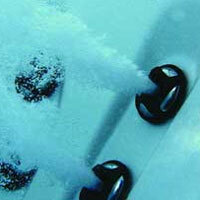 Quality designed hot tubs strategically place each jet to provide the highest level of massage programs. These programs are specifically designed to treat specific conditions and ailments. Anything from a stiff neck and sore back to a headache or insomnia. The correct jet placement can provide the relief needed. As you shop for hot tubs, consider a brand that will provide high-quality hot tub experiences. Consider taking a wet test before buying to ensure quality. A wet test allows the prospective buyer to fill the hot tub with water and test it out completely by experiencing the different massage features and adjustability. If the jets feel uncomfortable, play with the settings. This may be something as simple as a personal preference. Now that you know that you don’t need to worry about bruising while using a hot tub, download your hot tub buyer’s guide to learn about more benefits of the hot tub experience.